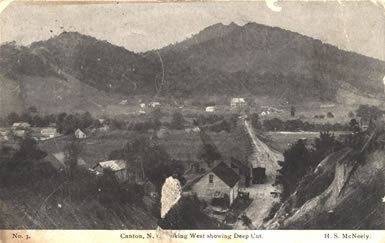 Canton, N.C. looking West showing Deep Cut. "The population of Canton is increasing more rapidly, perhaps, than that of any other town in this favored section. Five years ago it had scarcely 250 inhabitants. The Census of 1910 accredited it with the population figures here given. It is estimated that an accurate enumeration now would show nearly 3,000. Located here is one of the largest pulp mills in the United States. Both sulphite and soda pulp are manufactured in great quantities. This industry is accountable largely for the rapid increase of the population, as through it general business has developed to a remarkable degree. The surrounding country is devoted principally to fruit growing and truck raising to which the foot hills and rich valley lands are peculiarly adapted. "One mile east of Canton the Railway crosses the first of five bridges which span the tortuous Hominy Creek within a distance of seven miles, passing, meanwhile, through lands as fair and fertile as lie out-of-doors. After crossing the line between Haywood and Buncombe Counties, 14 miles from Asheville and 109.1 miles away from Murphy, Turnpike, a small way station located practically on the county line, is reached. It is simply a distributing point for nearby farmers and truck raisers." "Small amounts of pulp wood, chiefly poplar and linn, have been cut and shipped from the mountain region of North Carolina to pulp mills in adjoining states for the past ten years or more. Three or four years ago, however, after the Champion Fiber Co., of Canton, Haywood County, began buying wood, the industry became important. This company, which operates the only paper manufacturing plant in western North Carolina, uses some nine different species of timber, employs more than 600 hands, and converts into paper practically all the pulp wood cut in this region, besides a large quantity of chestnut extract wood." 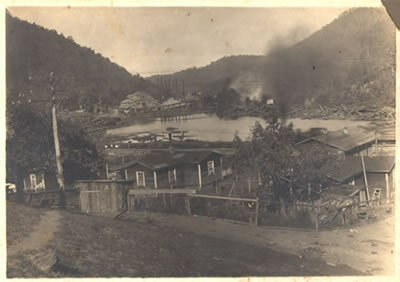 Likewise, a July 25, 1913, Supplement to the Jackson County Journal noted that Canton had “more real estate and taxable property than any town in western North Carolina, except Asheville.” Champion Fibre Company drew upon the region’s timber resources to produce wood pulp for paper production. 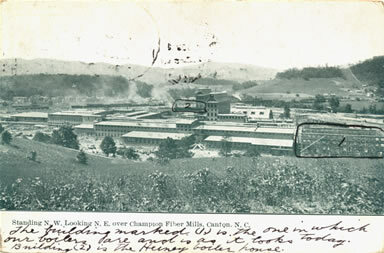 Standing N.W., looking N.E. 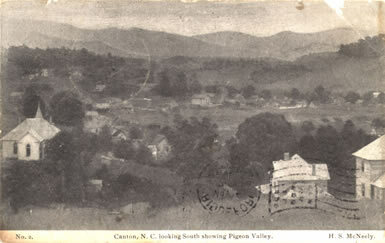 over Champion FIber Mills, Canton, N.C.
Canton, N.C. looking South showing Pigeon Valley. "A short distance beyond the second Hominy Creek bridge is Luthers, one of the many little accommodations stations established by the Southern Railway. It is 12.3 miles from Asheville and 110.8 miles from Murphy. In the space of a mile and three-quarters the Railway then spans Hominy Creek three times, the first station beyond the last bridge being Candler, N.C."
Poole, Cary Franklin. A History of Railroading in Western North Carolina. Johnson City, Tennessee: Overmountain Press, 1995.